One electronically tested silver and gold ladies custom cast & assembled pink tourmaline, peridot and diamond ring. 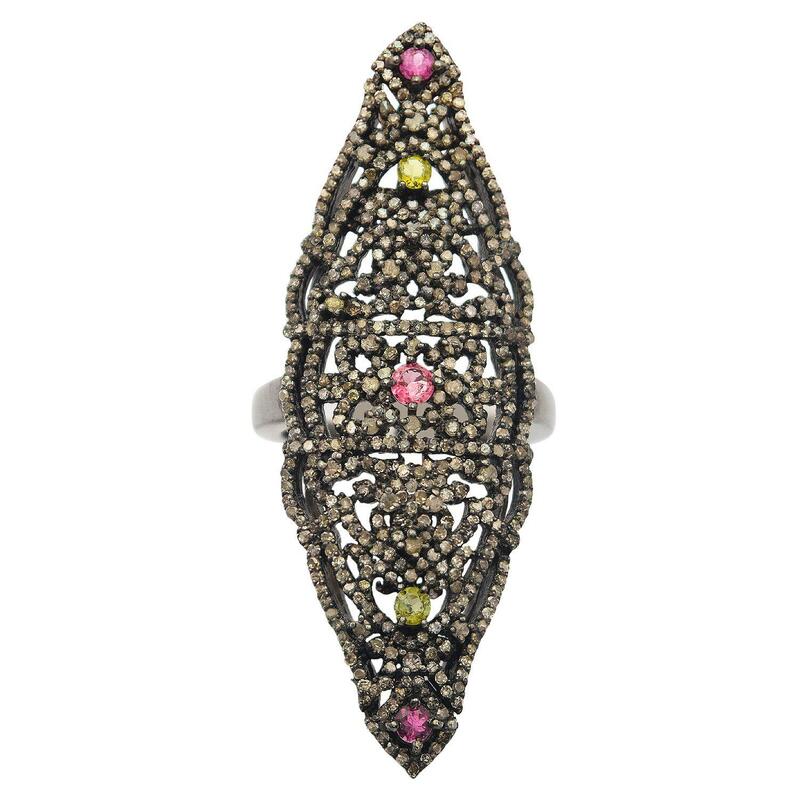 The ring features a two and one-quarter inch length lattice gallery with pink tourmaline and peridot accents, completed by a two and one-half millimeter wide band. Anodized finish. Condition is new, good workmanship. Three prong set round mixed cut natural pink tourmalines, measuring 3.00 - 2.70 x 1.85 mm, approximate total weight of 0.35ct., clarity is slightly included, type II, medium, very slightly brownish, slightly purplish red color, (GIA slpR 5/3), cut is good. Transmitting light with a minimum of distortion, transparent. Color grade is an average for the group. Graded in the setting. Two prong set round mixed cut natural peridot, measuring 2.60 - 2.50 x 1.66 mm, approximate total weight of 0.16ct., clarity is eye clean, type II, medium dark, very slightly grayish, yellowish green color, (GIA yG 6/3), cut is good. Transmitting light with no distortion, transparent. Color grade is an average for the pair. Graded in the setting. Two Hundred Fifty-Nine prong set single cut diamonds, measuring 1.50 - 1.00 x 0.75mm (depth est.) approximate total weight of 259 Stones = 2.90ct. The color grade reflects the entire range of color for this group. Graded in the setting.